The Auction is Just About Here! 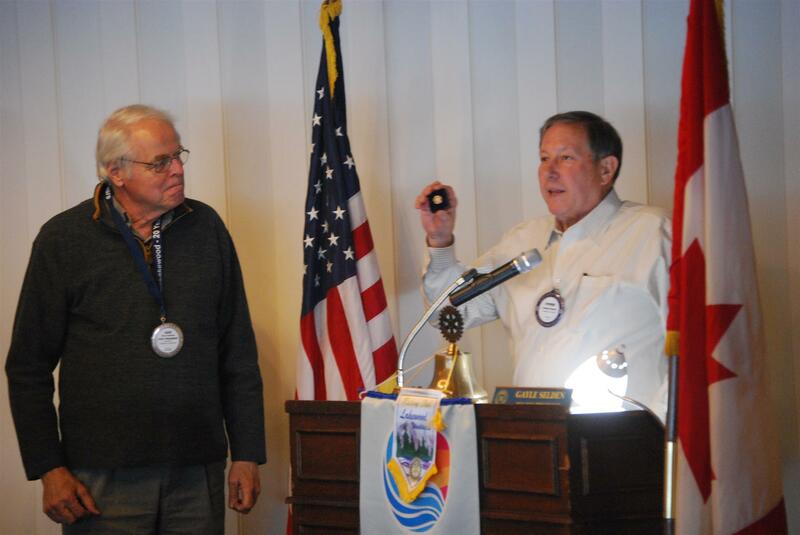 At 12:30, the bell was struck and another Rotary meeting began. Right on time. President Gayle welcomed the group and had Paula Olson give the Thought of the Day reminding the assembled membership of how lucky we are to be Rotarians, the peacemakers of the world. Next came the Salute to the Flag by Mo Sarram. Credit for making the meeting happen went to the local super heroes, “The Indispensables,” Duncan Cook, Bob Hammar, Rob Erb and Terry Roarke. The fifth member, Ward Fletcher, was away battling another foe, more on that later. Sally Porter-Smith manned the Sportsman’s Dinner Procurement desk. The Paul Harris desk was manned by Steve Enquist and Christine Vu, reporting $417.00 collected today. Nearly half a Paul Harris! Our Sergeant of Arms, who also sells the Raffle tickets, was Barb Spriggs. And the photographer was the amazing man of a dozen hats, Eric Quinn; and I am the Substitute Scribe, standing in for Greg Rediske. No visiting Rotarians today, but our guest was met with great enthusiasm: Cameron Christian, the young son of Leanna Christian. 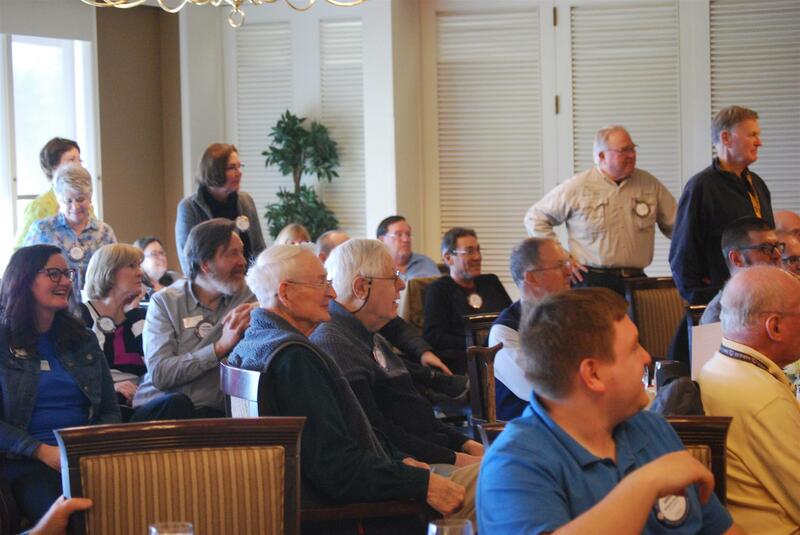 President Gayle instructed us in remembering that “… children are an important part of Rotary…” and she recalled her favorite times at Rotary Meetings with her Grandfather, Ed Selden, father of Rick Selden. I wonder if her fondness was brought by the grandfatherly attention, the luncheon or getting out of school to attend? Curious. John Forkenbrock had no sunshine to report but others in the room helped here. Ward Fletcher was fighting his archenemy by having a radiation treatment, Ted Wier successfully escaped from the hospital and is joyfully at home and Vaughn Hoffman was welcomed back as our newest bionic man, recovering from his broken leg with the addition of extra metal parts. It was told that the entire event was a “Moving Experience,” in that the day of Vaughn and Connie’s move to their new home, Vaughn falls and breaks his leg at the exact moment the moving van arrives at their old house. I’ll leave you to your own conclusions about how far one needs to go to get out of carrying boxes. Vaughn gave up $20.00. Announcements were directed at Puffins and officers, current and elected. 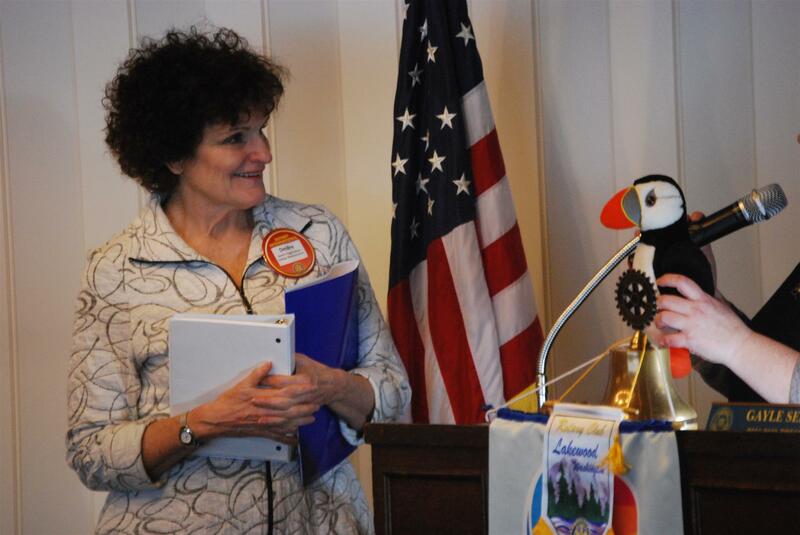 Puffins were reminded to attend the upcoming Board Meeting, Thursday next, March 21st, where President Elect Bill Potter will run the show. 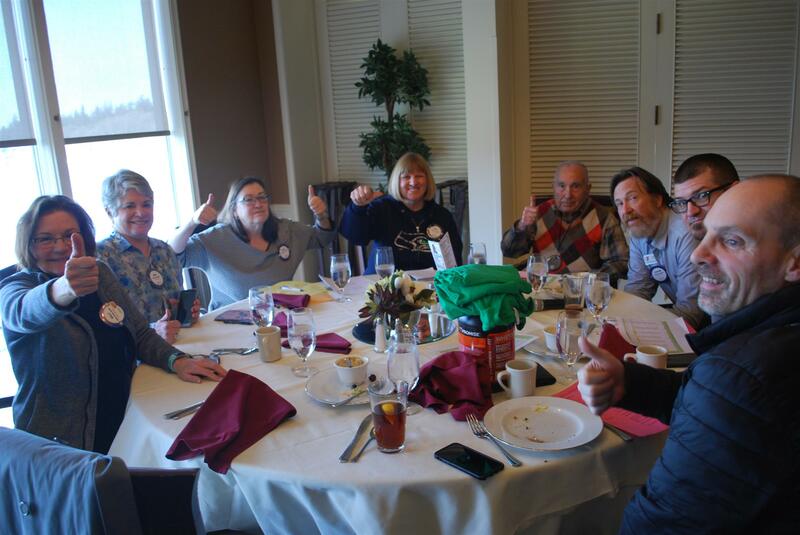 Officers, especially newly elected officers are reminded to plan to attend the District Conference, May 9-11 with Sally Porter-Smith, Joe Quinn, The Selden Gang and Greg and Mary Horn. District Membership Training is to be held on March 23rd in Tacoma and it’s FREE and comes with breakfast. See www.lakewoodrotary.com for more information. Sally Porter-Smith brought forth our newest inductee to Rotary, Deidre Soileau, with Gayle’s pronunciation notes, /DEE DREE SWAL LOW/. 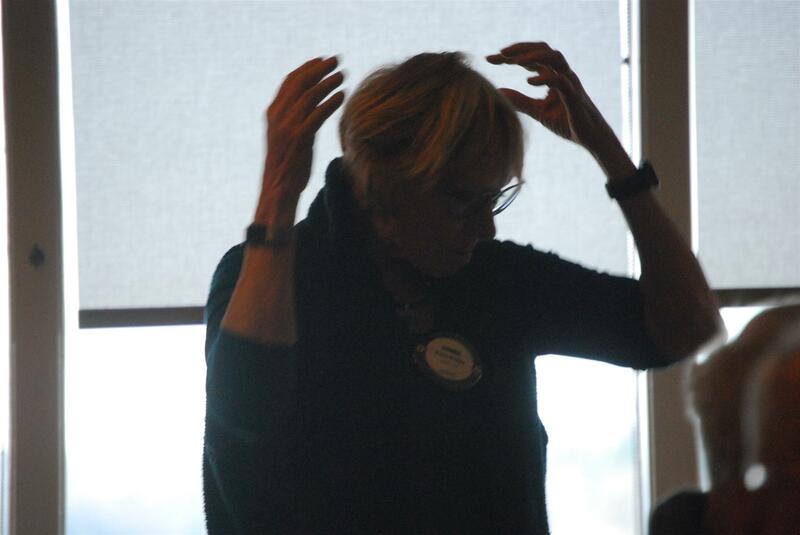 After the induction, the Rotary Motto with group participation and the passing of the puffin, Deidre told us a little about herself. She is originally from Cleveland Ohio and with the passing of her husband, she decided to move to the Northwest to be near her granddaughter. She has three children in the area and is currently employed as the Interim President at Pierce College. 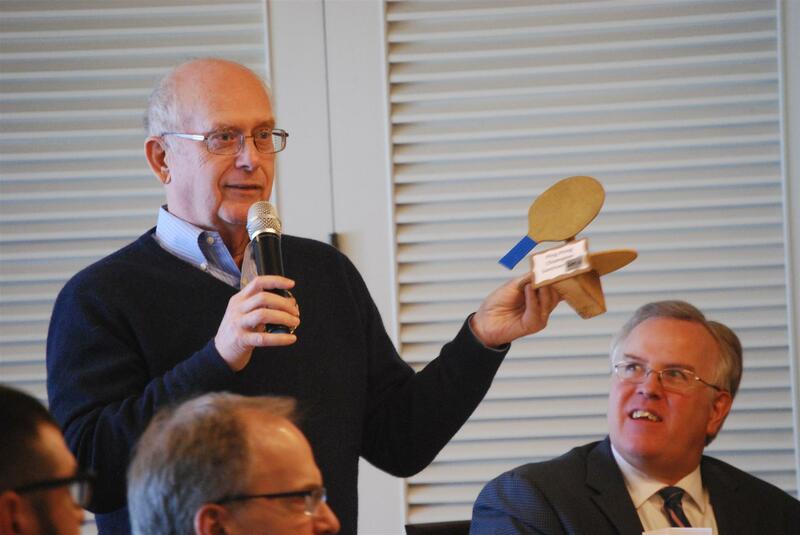 Then Steve Enquist, the Paul Harris Committee Chairman, came forward with Past-President Dave Coleman in tow. Dave was awarded his 6th Paul Harris from Steve who noted that, “It is one of the most attractive awards...as it has 5 sapphires.” Send in your nickels (about 120,000) and get your own from Steve. Fine-ally and ominously the infamous tiara was donned by our royal President, signaling all to sink down into their chairs and look furtively around the room. Jan Gee was the first fine-ee. She had another wonderful recognition to announce, if last week’s Women of the Year by the National Grocers Association weren’t enough. Jan told of this one taking place in Washington DC at the House of Representatives, where she was honored for her excellent work as a Woman of Industry. In a related revelation, she also has another grandchild. Fine: Ka-ching! Second was Joe Quinn and the announcement of his unexpected demise. Joe quoted Mark Twain, “The reports of my demise are greatly exaggerated.” Welcomed back; Joe paid up. The Sun River Skiers came next. Organizer John Lowney reported that only 4 of the dozen or so actually skied. All the others spent the weekend doing isometric arm curls with 12 ounce weights with his personal goal of 50 a day, receiving the admonishment from his wife Pam, “...to knock it off…," after a couple days. Joe Quinn complained of the lack of competition during the Ping Pong Tournament, reluctantly explaining that winning the sad, Ping Pong Champion Trophy, 4 years in a row was nearly unbearable. Joe asked if the club might sponsor table tennis lessons for Rick Selden. A harrumph or two was heard. Such a sad story and a marginal gift bag convinced Gayle to grudgingly pass on a fine. Donna Phillips was last to announce a St. Patrick’s Day Party at her house at 1410 Lafayette St. in Steilacoom starting at 4:00 and going until her bed time of 9:00 PM. I believe late revelers could stay longer to finish off the booze, if they cleaned up while they did. Donna continued with a story about her recent trip to Portugal and Ireland. In Ireland she and Andy looked for old family homes, finding a familiarly named sheep farmer who gave them a tour of his home. Donna kicked in twenty for the cause. On to the program, The Sportsman’s Dinner Update and Small Group Workshop. It’s that time of year again, everybody. Put your heads together, we’re ‘bout to have a party. You know what I’m talking ‘bout. I’m talking ‘bout the Auction. Think about what you can do to help with the Event. First, buy a ticket. Yeah you shouldn’t miss it. The last thing you want to hear at this event is crickets. So beep-beep, beep-beep, stop at the front table. Where we’ll be selling tickets to the Auction, yeah we’re able. Second, and this will all be music to your ears. I want all of you here to be a volunteer. With some yard work, or a Tahitian vaykay. Finally, the last idea is be a sponsor, of a table get some recognition if ya want ta. Put your heads together, we’re bout to have a party. Answering that GIVING MATTERS greatly, to us all. Eric then directed attention to the sign illuminating the 3.7 million dollars in contributions that Lakewood Rotary has raised and given since the club’s first grant in 1963. To that end, greater procurement is needed in these last two weeks heading up to the Sportsman’s Dinner preparation with special emphasis on the live auction items. We need those to be submitted ASAP and no later than March 22nd. Volunteers need to grab the sign-up list and take a job, perhaps a drink ticket salesman? Rick Selden reported on the Sponsor sales to date, shown on a pink page at each table. There is still time to be a sponsor and he’ll accept a check. How wonderful, so many places do not. Then Eric announced the small group work time and teams assembled at the various tables. Great brainstorming and inventorying of progress on team procurement was witnessed, some teams working after the ending bell had rung. Finally, President Gayle calls our guest, Cameron, up to draw the winning ticket for the Daily Drawing. After drawing the ticket, he ran back to his mom and needed to be coaxed to come back and surrender it. President Elect-Elect Mark Edgecomb had the ticket #2281, and dutifully drew a white chip, receiving $5.00. The bell rang and another meeting was over. Ah yes: Read this bulletin and tell Greg Rediske so you can get a make-up. Also, do your online shopping online so a portion of your purchase can be allocated to Lakewood Rotary.